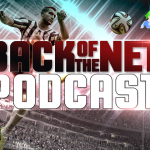 Welcome to Episode 97 of the Back of the Net: FIFA Podcast in partnership with Sweetpatch TV. This is your weekly FIFA, Sports and Banter Podcast. This week we have Wepeeler on and we talk about real life football inc. Champions League and Europa Cup draws and the new Dream League and we ask for your best moments of the podcasts for a compilation in episode 100. We hope you listen and enjoy.